Of the seven hundred public videos I have on youtube, the 1st, 2nd and 9th most watched video is about cleaning audio. 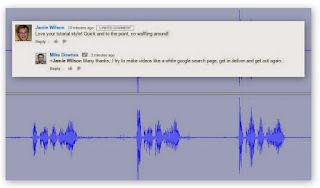 For example, watch the most viewed How to clean audio with Audacity: Noise Removal, Normalise and Compressor at this link. It's with that in mind I've started to listen to everyday sounds and how best to record them. One recent example, standing in a bathroom where the ceiling fan, water faucet, paper towel and plastic bin and made very distinct sound. Listen to this one. And then we had the walk in the countryside a few days ago where I made four recordings using the Moto G4 with RecForge II Pro, Sounds of the Countryside. The next step and to satisfy my curiosity was running a set of tests comparing the Moto G4 Mic with the Zoom H1. What started out as a Zoom H1 compared to Moto G4 - which is better quickly turned into a Could the Moto G4 be used as an adequate, if not brilliant day to day microphone? Where the Zoom H1 set of recordings are made as control audio. Take a look at the size of the microphones themselves with large XY Stereo set on Zoom H1 and the small pinhole mic on Moto G4. Much is seen as the same on a DSLR Lens with large multi part glass compared to small dot of a camera on a mobile phone. Any recorded sound must hit those mics and be converted into an electric signal to be recorded. Many mics these days are tiny (as seen on the lapel of TV presenters) and many are not (like the new China Radio telescope with a diameter of 500m, see my video. Light and sound have a lot in common - they both travel in straight lines and bounce off objects to reach out ears. Of course light will reflect off a surface, but only an image is seen clearly on the calm water of a lake or a mirror or glass. Any sound is made through a series of vibrations, sent through the air, solid or a liquid to be heard. we hope this sound is a pure form (like a voice) and not hindered by distractions (like wind, traffic, other voices etc). and if not as required, we use some other software like audacity to clean that audio, or to change pitch, tempo or a 100 other settings. ready to use as required as that single file of as a component in something else like: music, film, podcast etc.. I make these simple observations, not to take you back to Science 101, but to slow us down to think about getting back to basics. In a busy world with a mobile in our pocket, we tend to see that device as it's simplest and most urgent form, often to just make calls and to text. That's a huge shame - our phone is a multi purpose tool capable of hundreds of different tasks each and every day. There are six videos on my Make Good Audio Playlist. This post and these videos are all about listening - thinking about sound, best ways to capture, then save it. To do that - turn off your eyes for a moment and listen. And you need patience and time. Without that you have nothing. 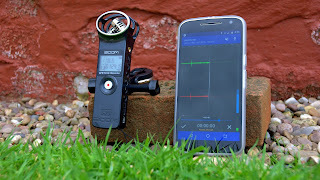 Conclusion of my testing - I would have no hesitation in trusting the Moto G4 Microphone and RecForge II Pro in recording decent audio in an situation. That's not to say I will not use the Zoom H1, rather when I hear and need to record the audio - it's out and about with the Moto G4 in my pocket (with the Zoom H1 somewhere at home). Old adage - the best camera, microphone, paintbrush, pencil etc is the one you have with you ..
For an extension, and one I play all the time - taking photos with a Nikon DSLR versus the Moto G4. Nikon will provide a RAW NEF file that are essential for me. Yet, out on the walk the other day I took 80 photos and only 4 of them were from DSLR. Another day it will be 80 with DSLR and zero from mobile. As a footnote, every video that's uploaded to youtube will have an automated transcript made, providing words can be detected. For my Introduction video, I believe the English Language text to be 100% correct. This has huge benefits, not only the obvious of being understood and helping people to learn across the globe, but to be found in search in the first place (as transcripts are search indexed). As said at Google IO 2017, 'to reach the next billion users, use simple global english' (slight paraphrase I am sure by me, maybe 'use simple global language' maybe better. Here are those words in full, so you can see the vocabulary. For the youtube support page, visit this link, Use automatic captioning.